One of the trickier parts of shopping for vintage when it comes to clothing are finding the right fit despite the number on the tag. Modern sizes and vintage sizes are different so many online vintage retailers offer the measurements of a garment while laying flat for you to check against your own. You then double it to know if it will fit. For example a bust size that is 19" across x 2 would be a measurement of 38". Sometimes measurements don't matter much as was the case with the denim jumper I found at a flea market and altered to fit with a different silhouette. I didn't take a before photo before cutting into it but it looked something like the dress in the middle in the pattern below. It was billowy and loose and had big sleeves with shoulder pads. I cut off the top just under the armpits and made a large hem all the way around the top making sure to hit about 2" above the top button. I added some elastic to the back of the top and could've probably used some darts in the front but I'm still happy with how it turned out. I didn't have to hem the bottom because the waist line had moved up from a drop-waist to an empire waist. Denim jumpers/dresses are one of the most common finds at thrift stores and I bet you could find a special one and experiment with your own silhouette. Some of my favorites from Etsy. 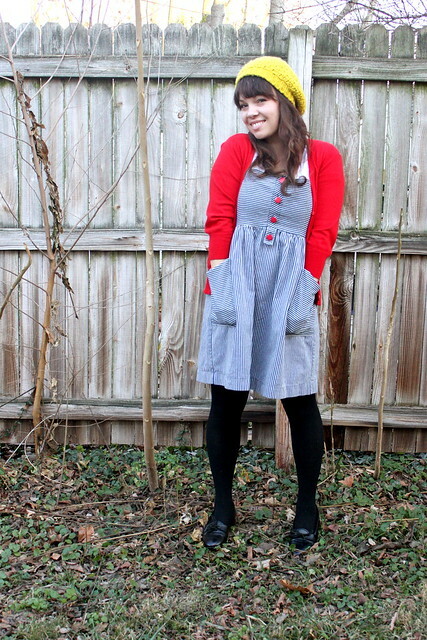 Here's a great post from Elsie about shopping for vintage online. Ruby's outfit for today included one of my favorite vintage dresses to date. The color is unique and the brown smocking near the top is darling. Since it has been in the 30's and 40's I layered her up with a long-sleeved onesie and then the dress and sweater. Had we been staying outside she would've also been wearing tights with her leg warmers! I made the leg warmers right before she was born from a pair of tights from Target. I now wish I'd bought two pair because it's such a great color palette. All I did was follow a tutorial to make baby leggings similar to this one. 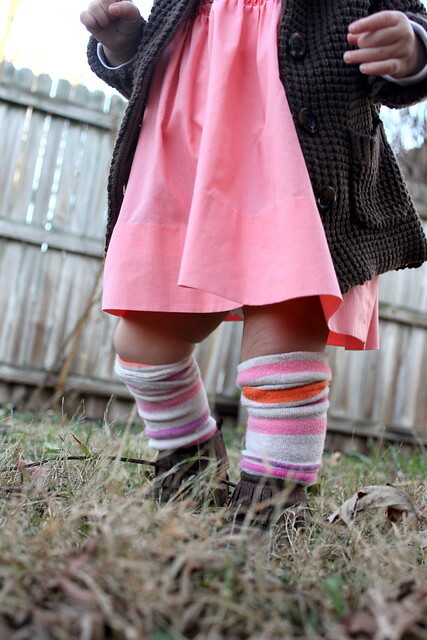 You can make your own from women's knee high socks or thick, knit stockings. It's an easy way to mix in patterns and texture in the colder months. Visit Rubyellen's blog for more vintage links and to learn how to hem a circle skirt. Thanks for the great response to this new feature! We'd love to know if you have any questions or topics you'd like to see us cover in future posts. Feel free to link up to your own vintage in the comments section below! ahh! what a lucky little lady you have. mamma and bean, sooo cute!! both of you look great!!!! i love the brown cardigan ruby's wearing. 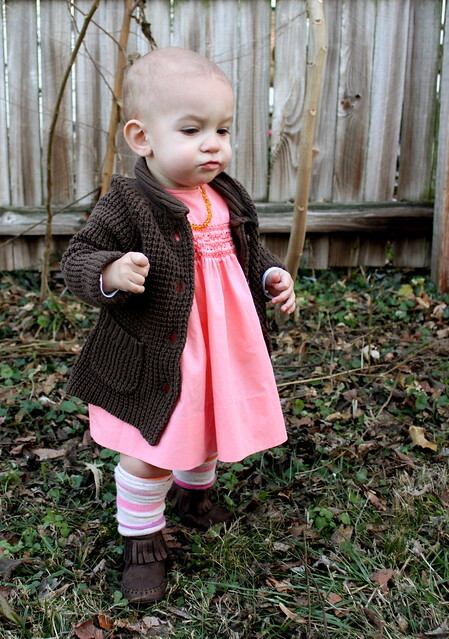 baby girls+cardigans melt my heart! very cute dresses on both of you! She's just adorable in that outfit!! Love the jumper- very cool. great outfits! i have a pile of vintage dresses waiting to be altered. this post and ruby's make me want to go do it now!!! 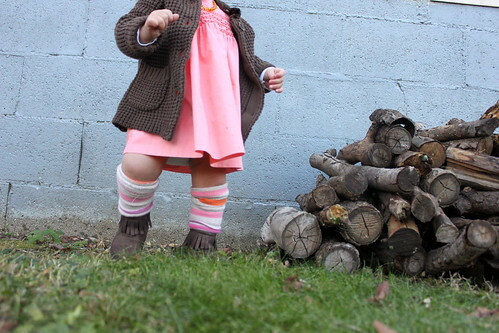 Oh my gosh I love her little knee socks! I'd try a simple burp cloth tutorial and go from there. It's the basics but then you get a cute little shower gift out of it without having to worry about wasting fabric, etc.